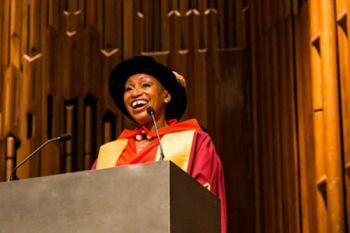 Sandie Okoro, Global General Counsel at HSBC Asset Management, has been awarded an honorary doctorate during City University London's summer graduation ceremonies. An alumna of the Inns of Court School of Law, now The City Law School, Sandie was honoured for her outstanding achievements in the legal profession and financial services. Sandie assumed the position of Global General Counsel at HSBC Asset Management in January. She is the only female lawyer from an ethnic minority holding such a position in the City. In 2014, for the third successive year, she was included in the Powerlist, which profiles Britain's 100 most influential people of African or African Caribbean heritage. You are graduating today from one of the most prestigious institutions in the United Kingdom - make the most of the education you have received. The most important advice I can give you is do not give up -there will be many barriers that you will face but never give up. Do not stand in your own way; you must believe in yourself." Born in London in 1964, Sandie read Law and Politics at the University of Birmingham, before attending the Inns of Court School of Law and being called to the Bar in 1988. Sandie decided to requalify as a solicitor and in 1990 joined Schroders, the international asset management company. At the age of just 25, she was appointed as Head of its Trustee Company. Sandie left Schroders in May 2007 to take up an appointment as the first General Counsel of Barings Asset Management. She led a team of lawyers based in London, Boston and Hong Kong with responsibility for the management of Barings' legal risk across the globe. Following 7 successful years at Barings, Sandie assumed the position of Global General Counsel at HSBC Asset Management. Sandie is a passionate proponent of improving diversity in the profession and has been involved in Legal Launch Pad, a programme primarily targeted at ethnic minority Law students run by the Black Lawyers' Directory. She also assists young aspiring lawyers by providing bespoke one-to-one mentoring and she co-founded the successful 'See The Possibilities' programme, which is aimed at students attending further education colleges in and around the London area.